It was past 3 in the morning that Axel woke up crying and screaming. Thinking he was hungry, his mother gave him three ounces of his Enfamil formula, but he only had one ounce. Minutes later, the baby became more fussy and cannot be comforted by anything. Almost three hours later, the baby finally slept while snuggling in his mother’s chest. At past 7, his dad woke up and got ready for work. But when he held little Axel, the baby screamed again. He had a fever which went down after a cool rag was placed on his head, but there is nothing that would soothe him anymore. His mother tried everything -- gas drops, burping, rocking, swaddling, bathing -- but nothing worked. It was then they decided to take the child to the ER. After getting to the hospital, the baby started having difficulty breathing. He went blue as he was lying down the hospital bed. After around 7 hours in the ER and multiple tests (IV, blood tests, spinal tap, etc. ), they finally admitted the child. That’s when they isolated the cause of the child’s woes -- infected blood that went up to the spinal fluid and the brain. The infection -- Cronobacter Sakazakii -- caused him to have seizures and mini strokes. He got the infection from his Enfamil. After two MRIs, it was shown that Axel’s entire brain was affected. He was having around 50 seizures a day. The doctors said that even if he survives this, the brain damage is too much that he won’t have a shot at normal life. He can neither smile nor see. After meeting with all of the hospital’s doctors and all their family numbers, they finally decided to pull the plug. The baby struggled without life support, but Axel’s fragile body finally succumbed. On June 9, 2016 we had to bring Axel into the Emergency Room because he had been excessively crying since 3:30 in the morning. I (mom) had done the same routine as i did every night got up at 3am made a 3ounce bottle (little bottle because he wasn't eating much anyhow) he would eat a whole 3ounce at night though when i got up with him but this night he would only eat a ounce or so. I then changed his diaper and put him back in his bed that was about 3:30/3:35 a.m. Gave him his binky and he fussed at first but then took it and closed his eyes. So i went potty & checked on him again before laying back down & he was content. About 10 minutes later he became fussy and crying & nothing would comfort him. Daddy tried for a good hour to get him to calm down, but he handed him to me (mommy) so he could try to get some rest because he had to work early in the morning. Axel continued to cry, scream, fuss & just be miserable until about 6 a.m. I FINALLY got him to go to sleep holding him snugged to my chest so i stayed awake and watched my baby finally get some rest. Daddy got up at about 7/7:30 a.m to get up for work & when he did he wanted Axel so we switched him off as we did Axel screamed. ((& know every time we would move Axel or if we even barely messed with him he would scream)). Axel had a fever of 100.3 but it went back down to normal about a half hour after me putting a cool rag on his head...We had tried everything to sooth Axel before going into the ER. We tried gas drops because maybe a stomach ache..nope..tried burping him multiple times..rocking him..swaddling..gave him a bath..NOTHING HELPED..he continued to scream besides maybe 1minute intervals of him TRYING to sleep but he couldn't. So about 12:30 in the afternoon we said enough was enough we felt so bad for our baby boy (it wasn't about being irritated with him screaming, we hated to see him like that knowing SOMETHING hurt) we took him into Helen DeVos children's hospital. ((he continued to scream during everything!)) I (mommy) had my arm under Axels head while he laid on the hospital bed & he went COMPLETELY blue on me & stopped breathing. He wasn't breathing very well either after getting to the hospital he was grunting while breathing which meant he was struggling to breathe. They did multiple blood tests & IVs & spinal tap. They admitted him after about 6 or 7 hours in the ER. after all said and done they found out he had a bacterial infection in his blood that went to his spinal fluid which led to his brain, causing multiple mini strokes which led to multiple seizures as well. The infection is called Cronobacter Sakazakii. He got this infection from the infant powdered formula we had been feeding him (Enfamil Gentlease), the formula was contaminated!!! This infection comes along with meningitis & sepsis. 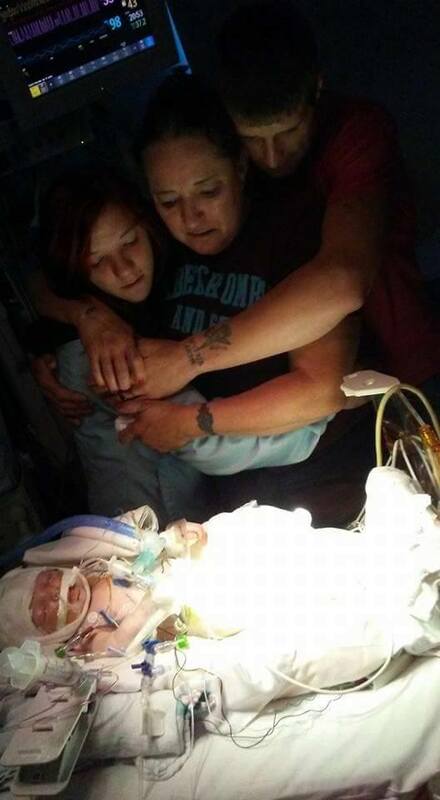 Axel was in critical condition & on life support because he couldn't breathe on his own. After MRI results we found out all four parts of his brain (left & right front & back) where affected severely. After a second MRI it showed that even the bottom part of his brain was affected. Meaning he wouldn't have been able to do anything at all down to even smiling & seeing. & that was only if he made it through coming off life support. Also him have up to 50 seizures a day lasting from 10 seconds to 100 seconds long. After having a meeting with every single doctor & family member, & with the doctors telling us Axel wouldn't have a chance at life we made the very hard and heartbreaking decision to take him off the life support & pray for a miracle. After mom & dad talking to the doctors multiple times after the meeting & seeing our baby boy still struggle & suffer we decided it was time. They took him off life support around 3 or 4 in the morning on June 18. He fought SO HARD...SO HARD..but his little body just couldn't do it anymore. He passed 3 times but coming back each time to give us just a few more breaths but then at 11:35 a.m he took his last breath & went to be with the Lord...HE WAS AND ALWAYS WILL BE OUR MIRACLE BOY & IS NOW A CHILD OF GOD!!! R.I.P AXEL BURNETT SHEARS ....WE LOVE LOVE YOU TO THE MOON AND BACK!!!!!! Our little boy was only 27 days old, buried at exactly one month old. The Facebook post attracted a lot of comments from other parents. They claimed they experienced the same effects after feeding their children Enfamil. Enfamil was also present, parrying the claims. They asked the concerned parents to share their stories directly with the company. Whether the formula has been contaminated after opening has not yet been confirmed. But whichever way it is, it serves as a warning to be extra careful in everything that concerns our little ones.